Parish of Auchterderran – The Fife Post………..for genealogy and historical information. AUCHTERDERRAN, a parish, in the district of Kirkcaldy, county of Fife, 6 miles (N. W. by W.) from Kirkcaldy; containing the village of Lochgelly. The church was built in 1789, and is situated near the east side of the parish. There is a place of worship for Seceders, in the village of Lochgelly. 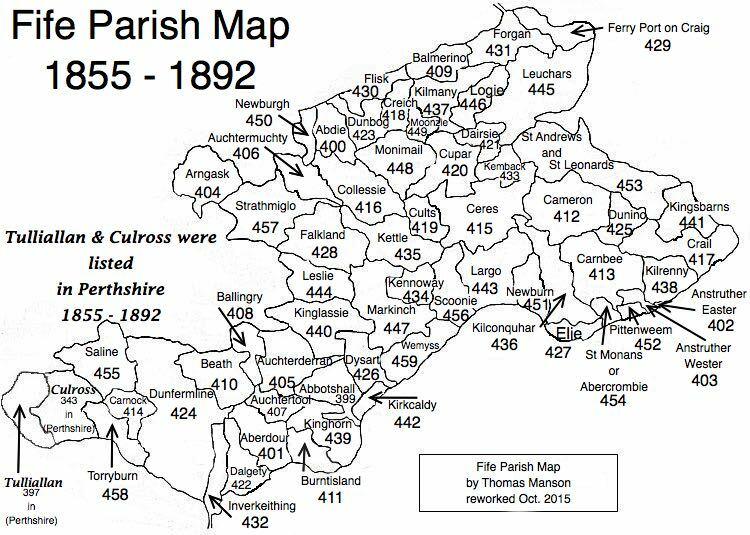 The population of the parish in the 1750s was about 1200, in 1821 was 1488, and in 1831 was 1590. The only village is Lochgelly with a population of 612. Potatoes, turnips, and hay are grown along with wheat, barley, pease and beans, and oats. The Fife breed of black cattle is raised. Coal and limestone are both quarried. The parish church was built in 1789. About half of the population is dissenting or seceding Presbyterians and there is a dissenting meeting house at Lochgelly [see below]. There are three schools (one parochial and two village) within the parish and a border school. The total attendance is about 250. There are 12 ale houses in the parish. The above extract is from the account written in May 1836 by the parish minister, who had served there for fourty-nine years and makes several observances about the changes that have occured in forty years times.